This morning, as I read the entry in my Blessed is She Lenten Journal, this was brought to us: Imagine yourself at the foot of the cross. Imagine Mary & John beside you. Wow. When I started writing, I didn't think I'd have enough room to write what was going through my head. So, I opened up my laptop, and here I am. How my heart aches at the cruelty of man. How quickly our hearts and minds can change. During the procession around the church of the Blessed Sacrament during Holy Thursday's Mass, I imagined the people following Jesus into Jerusalem on Palm Sunday; then I imagined how many were at the cross when he was crucified. I wondered just how many people actually went into the Adoration Chapel between the procession and midnight. Obviously, not everyone would be able to fit into the chapel, but I wonder just how many went? I didn't. I was tired, I had a headache, and I just wanted to go to bed. I have a lot of things to do today, Good Friday, and those things kept going through my mind. I realized I’m just like those people who followed, but then abandoned him when he was put to death. I realized I’m one of those in the crowd who yelled, “Crucify him”. And I’m ashamed. During Dynamic Catholic’s BestLent Ever, the focus was on how we resist God through resisting the little things in our lives. It starts with the resistance to even get out of bed in the morning, choosing to hit the snooze button instead. This series made me realize how much resisting I do. I resisted going to confession until Wednesday afternoon. There was a struggle going on within me: Do I call the church office or just skip it? It was so late, surely Father is busy and won’t have time. Finally, at 2:45, I gave in and called. I found out I wasn’t the only one who needed his/her confession heard at that late an hour. The Associate Pastor wasn’t there yet, but the priest at the mission church was, and while I don’t think he really wanted to hear my confession, he did. (This was after me telling him that it wouldn’t take long…I was almost perfect! Oops…forgot to mention that sin during my confession!) I’m so glad I gave in and called and that he heard my confession; I think I would have felt really guilty going into Easter Vigil without receiving absolution. During Lent, I’ve been going to the outdoor Stations of the Cross and going through them on my own so I can spend Friday evenings with my husband. Last Friday, I just wanted to go home after work. It was cold and I was tired. I had to make myself go, but I did go. Resistance didn’t win that day! I could have gone back over to the church last night for Adoration. I don’t live very far from the church, so that wasn’t the issue. I was selfish. My headache went away, but I didn’t go back over. 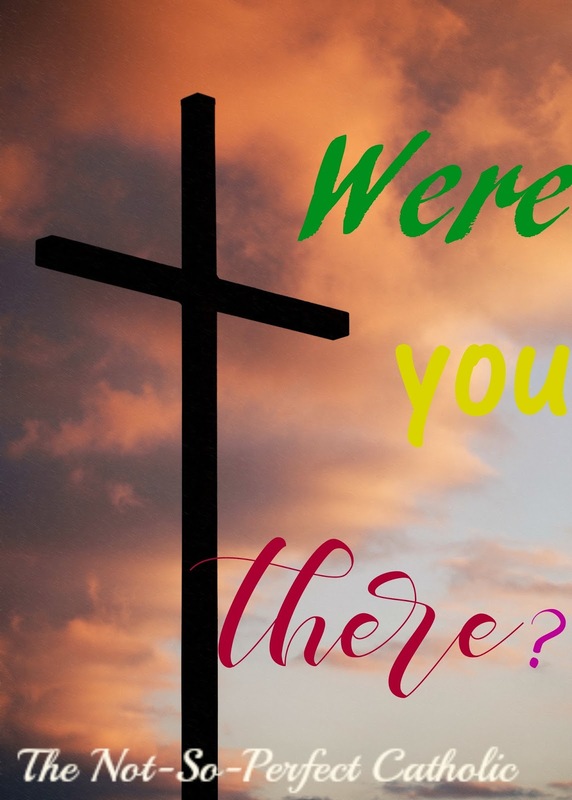 Maybe I didn’t leave Jesus completely alone, because I’m sure the priests and deacons were there; but, was there anyone else? Is that what happened when Jesus was crucified? Did the people just go home and go about their business? Did they even give him another thought? We may not have been physically there during the crucifixion, but we can be spiritually there every day. We can resist him, or we can take that extra step to do what we should. We can truly follow him all the way, offering up our little sacrifices in order to be closer to him. Even when we have a headache, we’re tired, and we just want to go to bed.